Bring your little people to come play and celebrate their awesomeness! 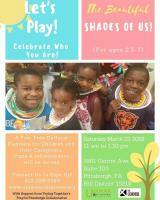 Ujamaa Collective will be hosting The Beautiful Shades of Us next Saturday, a FREE cultural playdate for children ages 2.5 to 7 and their caregivers. If interested, contact Ujamaa Collective at 412-228-5160 or visit www.ujamaacollective.org! They will send you the RSVP link to reserve your space for affirming fun!